My thirty-fifth ground of 2017 was on Tuesday 26th December at Hall Lane in Willington, County Durham. The match was Willington vs. Tow Law Town in Northern League Division Two. Hall Lane is close to the centre of the small town of Willington and is surrounded by housing on all sides. The ground is 4 miles north of the nearest railway station at Bishop Auckland and 7.5 miles south-west of the nearest major railway station at Durham. Spectators enter via the eastern side of the ground and there is a nice clubhouse building by the turnstiles. Directly in front of this is a small parking area before reaching the actual arena. This side has the Jackie Foster Terrace - an uncovered 4-row concrete terrace with one dugout in front of it. To the right of the terrace is a secondary club building with dressing rooms and a tea hut facing out towards the terrace. The roof of this building extends out slightly towards the pitch allowing a covered section with a handful of seats for players and officials. The the right of this is the second dugout and then an area of uncovered standing in front of a fairly flat grass bank. The other three sides are all at the foot of a grass bank which encircles the ground. The largest stand at the venue takes up the middle third of the western side of the pitch. This structure has 5 rows of wooden benches fixed onto concrete foundations and has a capacity of 350. There are several supporting beams holding up the roof and two floodlight poles in front of the stand all of which restrict views to an extent. Either side of this there is uncovered standing. The southern end has a covered 4 row metal terrace directly behind the goal with uncovered standing either side and it is a similar set-up at the northern end with a single stand behind the goal. This construction, the Bob Nichols Stand, is a covered flat concrete area. The away side went into the game one place outside the promotion places but struggled on the day against their mid-table opponents. The early going was marked by several strong tackles flying in from both sides. 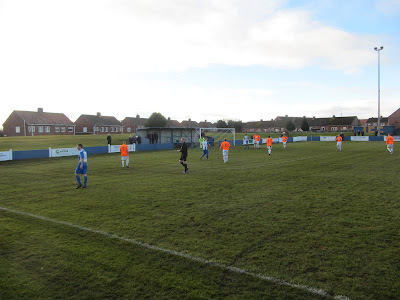 Fortunately rather than boiling a football match soon broke out as Willington went close in the 17th minute when Jeffrey Smith's delicate chip from 25 yards was just tipped over by Tow Law keeper Tom Orton. The visiting shotstopper was called into action again a couple of minutes later when a corner was headed towards goal requiring Orton to save on the line to keep the score level. Willington continued to have the upper hand and took the lead in the 35th minute. Jason White picked up the ball on the left and smartly cut inside beating two defenders in the process. Advancing on goal he rode a third challenge before striking a strong shot at Orton who saved but unfortunately for Tow Law the ball bounced back to Conor Winter who smashed into the roof of the net. In the period after the break it was the hosts again looking strong, it should have been 2-0 in the 58th minute when the ball broke to Jeffrey Smith on the left of the area but with only the keeper to beat he produced a tame shot which was easily saved. The respite lasted only a minute as Andrew Taylor got down the byline on the left and his low ball across found Damon Ellis who knocked in from a couple of yards out. To be fair Tow Law reacted to going 2-0 down and so nearly got a goal back in the 66th minute when a Lewis Teasdale free-kick came back off the post. The visitors had the perfect chance to reduce the areas with a quarter of an hour remaining when Teasdale was tripped during a scramble in the six-yard box. Dean Thexton struck the ensuing penalty kick to Lewis Graham's right but the Willington keeper guessed right and deflected the ball away to safety. This knocked the stuffing out of Tow Law and they were fortunate not to concede two minutes later when Damon Ellis' one-on-one encounter with Orton resulted in his weak shot being saved. If there was any doubt as to the result this was stamped out in injury time as the ball was played into Conor Winter from the right. Winter had plenty of time to control the ball and though his first effort was saved the ball fell at his feet again and this time he rounded the keeper and knocked the ball into the net to finish off a great 3-0 win for Willington.